Richard Mille has just announced that an Olympic sprinter will be running with a tourbillon on his wrist, much like how Rafael Nadal plays tennis with his RM027 tourbillon on his right wrist. 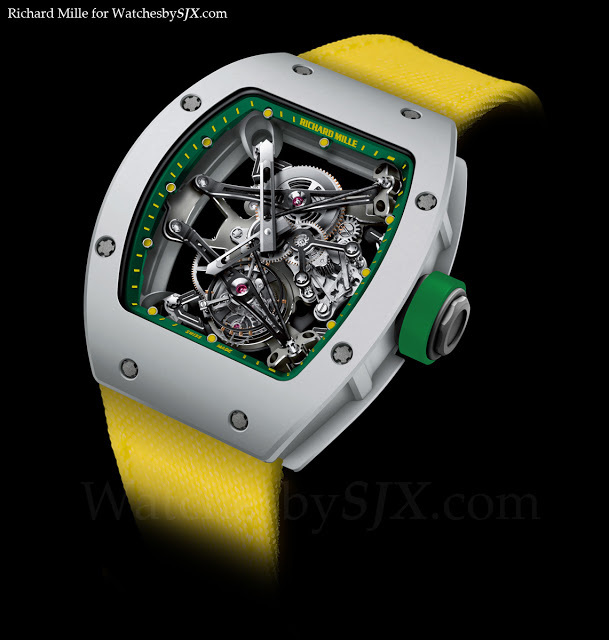 Looking like a variation of the RM038 Bubba Watson, this new ultra-light tourbillon has a yellow, green and black colour scheme, just like the Jamaican flag. So perhaps it’s Yohan Blake or Asafa Powell? Fellow Jamaican Usain Bolt is already a Hublot ambassador. The athlete’s identity will only be revealed three days after the closing of the games though the watch will be obvious on the wrist when the race is run. – SJX Update: Yohan Blake is the new RM ambassador. Completed after six years, the two tonne Richard Mille Quebec clock was presented for the first time in the Swiss town of Porrentruy, before it heads to its permanent home in Quebec.